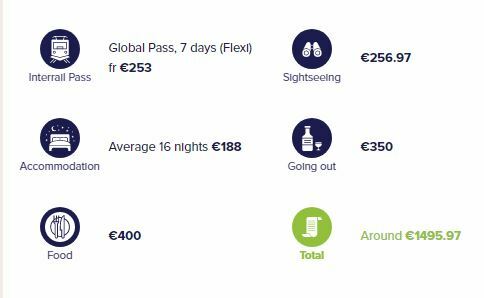 Three Weeks, Eight Cities And An InterRail Adventure For Less Than €1,500! Are you ready to be pulled along on an adventure that will tie you up in knots of excitement? Okay, maybe you’ve heard that one before, but if you are looking for an adventure this summer that highlights a variety of different aspects of Europe you best keep reading. Relax during the day and hit up some of the best nightlife clubs and bars in Budapest. Or spend your time viewing multiple historical sites and museums, the best part of this route is you have the flexibility to chose what you want to do in some of the less well-known parts of Europe to travel. Buckle up because you are going to see some awesome sights if you are on a shoestring, (aka you want to avoid truly expensive parts of Europe). If you want to get the best value for your coins, this eight-part adventure for less than €1,500 ALL-IN is for you! Kraków is one of the most underrated cities on this list, for its great hiking trails of the Tatra Mountains and Medieval Castle complex. Kraków also has a Jewish quarter and lots of history about World War II in its Schindler’s Factory. You can also find some more political history from the 16th century at Wawel Royal Castle. For some great Polish food at several milk bars, a Polish form of a cafeteria. Kraków is also home to the biggest city square in Europe (bigger than the Vatican) and it is a hive of activity seven days a week! 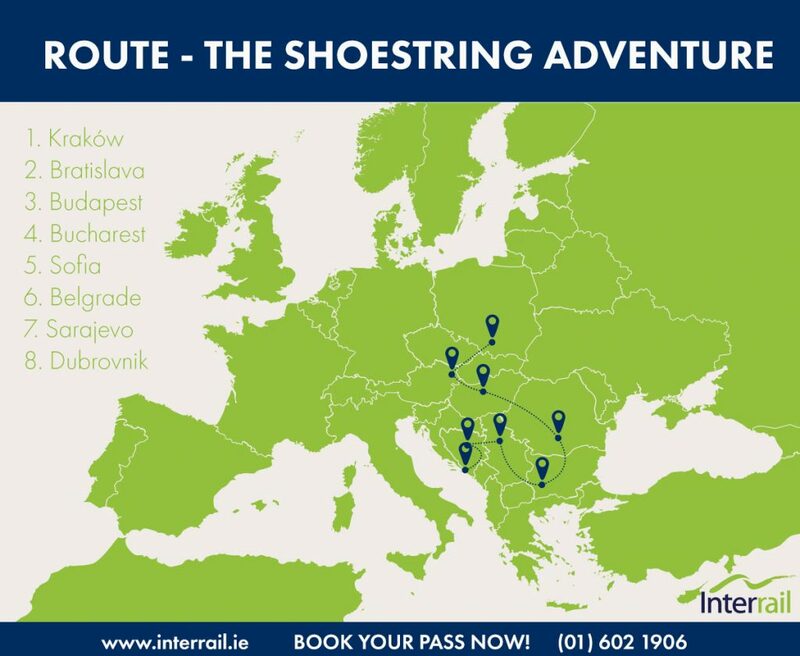 This next stop on this string is just on the border of Austria and Hungary, Bratislava in Slovakia. In terms of its main attractions, you can see Devin Castle, otherwise, if you’re already tired of touring castles and medieval history all day you can gear up for Bratislava’s nightlife. Bratislava offers several highly rated clubs including Nu Spirit Club, The Red Lions Club and Channels. While you’re out you can dive into Slovakia culture by choosing one of their most traditional drinks – Slivovica. If you’re a big fan of architecture then Budapest is the right place for you. There are so many jaw-dropping Renaissance and Neo-Renaissance styled buildings here. Don’t know what exactly that means? Don’t worry, it basically means all the buildings are a blend of old and new and are breathtaking to look at even if fancy buildings aren’t your thing. Another heavily underrated city for its nightlife, you can participate in Budapest’s free pub crawl or dance the night away at Budapest’s Peaches and Cream Club. You can also party right on the Danube on Friday and Saturday nights from May to October. Oh, there is also the small matter of Sziget Festival 2018 in August too. We went in 2016 so if you want to find out what this dream week is all about you’ll have to see for yourself! For all you shopaholics out there, you can probably put this next stop on your list. The capital of Romania, Bucharest is a large commercial centre with many remnants of its communist past. If you’re a history buff you may find the city’s Lipscani district the most interesting. Near its historical district, is Bucharest’s nightlife which homes some familiar Irish pubs, clubs and discos. The best part is many travellers familiar with Bucharest have found it to be pretty safe so you shouldn’t worry too much if you shamble along home late from your favourite pub. Sofia has a long history throughout Greek, Roman, Ottoman and Soviet times. As one of Europe’s oldest cities, Sofia has a lot to offer in terms of historical sites to see, including its wide variety of churches. The best part of Sofia besides it being Europe’s cheapest city is the fact that many of the places you may want to see are free! Take the local bus and go hiking on Vitosha Mountain, or spend the day doing the Free Sofia Tour and see the best sites of the city. If you love drinking coffee then you’ve come to the right place. Almost everybody in Serbia is a coffee connoisseur and apparently take it very seriously. So if you’re an espresso or cappuccino aficionado, then this place is the one for you. After you’ve had your fill of caffeine head down to Serbia’s Belgrade Fortress to learn about Serbia’s extensive military history. If coffee isn’t exactly your cup of joe, then you can certainly head over to one of Serbia’s winter or summer clubs (depending on the season) and grab a drink. Serbi’s clubs typically don’t charge entrance fees, so don’t worry about shelling out an extra coin or two. When your feet touch the ground in Sarajevo, the first thing you should do is head over to its cultural centre, Baščaršija. Baščaršija is probably the main tourist attraction in Sarajevo, but it’s still worth going to see. A bazaar, or an enclosed marketplace, Baščaršija offers curious tourists a view of some of Sarajevo’s old Ottoman architecture and many carefully crafted products including jewelry, pottery, etc. You can also check out Sarajevo’s amazing tunnel museum, also known as the “Tunnel of Hope.” The tunnels acted as an escape or a lifeline during Sarajevo’s most recent history in the early 1990’s when Sarajevo was sieged by Serbian forces during the Bosnian war. The museum can explain much of the history that still remains on many locals minds. Want to finish your adventure in the home of the Iron Throne at King’s Landing? Of course you do! Look no further because you’ve arrived at your final destination and can feel free to kick up your feet on some of Dubrovnik’s best seaside beaches. The best part of Dubrovnik is the fact that its beaches are usually frequented just by the locals, so if you are worried about being surrounded by tons of fellow tourists like yourself, you shouldn’t be! You can find most of the locals at the Sveti Jakov Beach. This beach also offers some rental options so if you want to get off your towel for a day, try to go kayaking! Protip: Dubrovnik is notoriously expensive, but luckily there is a small neighborhood ten minutes away from the Old Town named Lapad. Lapad offers a nice escape from the touristy part of Dubrovnik with a variety of restaurants and bars. For more updated price listings, check out the price of travel, to help you budget your trip!